The Adelaide Convention Bureau recently released its half yearly figures, the result is a solid A+. After securing a record $210m in the previous financial year the Bureau has surpassed expectations and provided a strong 6-month period of results. Never before has the Bureau had such a strong 6-month period. The Government Convention Bid Fund along with a dedicated team which have access to multiple platforms of business development are having dramatic impact on the amount of business being won to the destination. This glowing report card however is just an opportunity to quickly reflect on how successful the past 6 months have been as the next 6 months are going to be the busiest of the year as the Bureau attempts to convert a pipeline of activity worth $258 million of business. 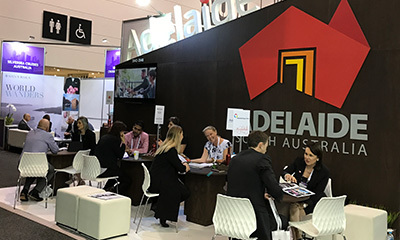 Fresh off the tradeshow floor the Bureau and Team Adelaide partners have recently returned from exhibiting at the Asia – Pacific Incentives Meetings Expo (AIME) in Melbourne. What was the talk on the floor and how did Adelaide present itself? For those new to the business events world, AIME is a two-day tradeshow which provides venues, suppliers and Bureau a chance to exhibit their product whilst meeting selected hosted buyers from the Asia Pacific Region. It’s still early days but it appears that whilst buyer numbers where down the quality of the buyers was better than expected. Overall the exhibition has reduced its foot print from previous years, but the issues of booking streams and no-shows appeared to have been reduced. Leaving Team Adelaide partners relieved with the business of getting on with business. The Bureau would like to take this moment to thank Team Adelaide members; Adelaide Convention Centre, Adelaide Expo Hire, Mercure Grosvenor Hotel Adelaide, Novotel Barossa Valley Resort and Morphettville Racecourse for their participation and extend thanks to Adelaide Expo Hire and Haighs for their support and sponsorship of AIME 2017. A full debrief and report will be provided to all members in the near future. Destination South Australia has gained the reputation as the state’s leading opportunity to showcase products and services whilst providing great business and networking options for both exhibitors and hosted guests, all on the door stop of Adelaide. With 3 weeks to go the Bureau office is finalising preparations for the destination showcase. This year’s event is on track to be bigger and better than last year, with over 40 hosted buyers and guests due to arrive in Adelaide. 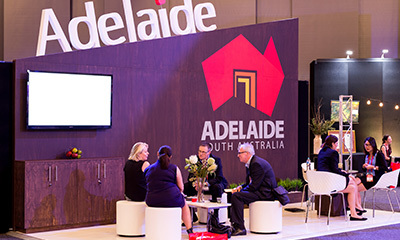 Destination South Australia is a unique event in that it puts hosted buyers on the doorstops of members that might not be able to attract potential clients to Adelaide. In 2017 there is a perfect mix of business that has already been won to the destination and events that Team Adelaide are still bidding for. The rise of international interest is also evident in this year’s event with a large contingent from New Zealand attending along with key decision makers from Indonesia. 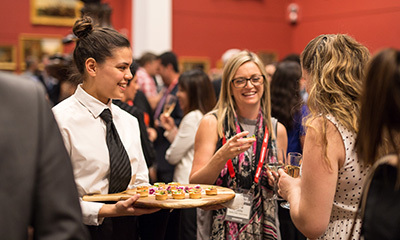 The Bureau is excited to announce the Welcome Reception will be held in the Adelaide Botanic Garden’s First Creek Wetland which will no doubt be a dynamic venue to represent a city of contrast. The Bureau has yet to announce the venue for the Destination South Australia Dinner but the word is that it will be a surprise to all guests and exhibitors attending! As always, this event cannot happen without the support of its sponsors. In a world that is ever changing it is refreshing to have a partnership that has lasted the ages and is the backbone of such an important event to the business events industry in South Australia.